If you are interested in reducing your home heating costs in the winter while experiencing the ultimate comfort of radiant heat, Climatrol’s licensed technicians are available to assist you with choosing the ideal system and options to meet your requirements. As always, we will ensure that your units are installed according to code for safety, and you can rest assured knowing that your system will be installed by seasoned professionals whose entire careers are dedicated to the HVAC industry. For over 40 years, our family has been serving our valued residential and commercial customers in Clarksburg, WV and Bridgeport, WV, as well as throughout the surrounding areas of West Virginia. At Climatrol Inc., we strive to help our clients achieve maximum energy-efficiency regardless of what system they choose. We will meet with you to learn what your heating requirements are, assess your needs, and determine if a radiant system is the right choice for your installation. When we have determined where your system will provide the most benefit, we will discuss your options and assist you by providing the information that you need to make the best decision for your home’s energy needs. Our technicians offer prompt, professional installation with minimal disturbance. Radiant systems allow you to choose from several options to meet your needs and can be installed in the floors, walls, or ceilings of your home or office. The enhanced heating efficiency and comfortable warmth that enrobes you is a pleasant surprise for many of our customers. Instead of spreading warmed air through the room on currents, your radiant heating system functions similarly to the sun. Heated energy is projected to objects within the room (including you.) Radiant systems are safe and highly effective. Because heat rises, many of our customers choose to place their radiant heating system within the floors of their homes, or as an enhancement for the bathroom floors alone, so as to never again experience the discomfort of a cold floor underfoot following a bath or shower. 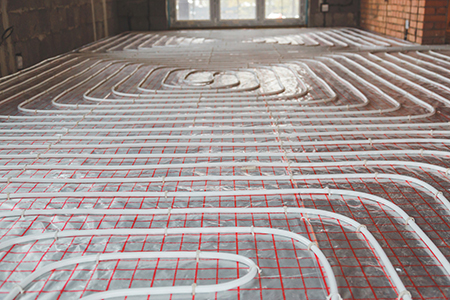 Radiant heating provides a gentle, even heat for the entire room, without leaving you with cold spots, periods of inadequate heat, or drafty conditions. Radiant heat uses significantly less energy than traditional heating systems. It is the heating system of choice for locations where energy costs are high, for homes located off of the power grid, and for cost-conscious consumers everywhere. Several energy sources can be used to power your radiant system. For more information about installation configurations, to request a free quote, or to schedule your radiant heat installation, repair, or maintenance service, contact Climatrol at: (304) 623-0606.